As a completely local company, we have one simple goal – to be the best powder coating service in Glendale. With rave reviews and tons of repeat business, we know that Glendale Powder Coating is on the right track and that our commitment to nothing but the best quality resonates with those in our community that won't settle for less. In addition to powder coating, Glendale Powder Coating also provides sandblasting services and limited welding and fabrication work. 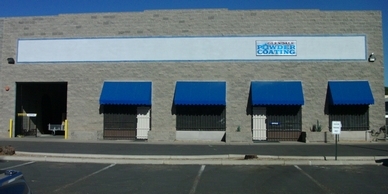 The simple truth is that Glendale Powder Coating serves people from all walks of life in Glendale. From homeowners that bring in rolling fences for a powder coating job to classic car aficionados that are working on perfecting their latest project to industrial businesses that need tubular frames, we've done it all and continue to be surprised by the wide diversity of projects we've completed. Part of the reason why we're the premier powder coating service in Glendale is because we're willing to take on even the toughest of jobs with a tight schedule and budget. Even under the strain of a rapidly-approaching deadline, you'll know that our quality is without question and you've gotten the best powder coating deal in the city. Call 623-937-5557 to learn more about Glendale Powder Coating services and our affordable pricing.